This is the deluxe edition of the first game published by nestorgames in 2009 and the first game designed by a computer: Yavalath. With its release, nestorgames celebrates its third anniversary. 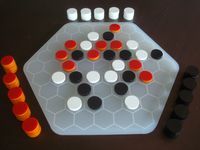 Yavalath is an abstract game for 2 or 3 players that was designed by a computer program called LUDI (invented by Cameron Browne) in 2007. The goal of the game is to place four stones in a row without first making three in a row. With this set you can also play the hexagonal version of Pentalath (also invented by LUDI), Susan (by Stephen Linhart), Taacoca (by Vikingur Fjalar Eiríksson), Cross (by Cameron Browne) and OMEGA (by Néstor Romeral Andrés) to name a few. This gigantic edition includes a large briefcase, a 35 cm diameter and 8 mm thick laser-cut 'ice' acrylic board (with laser-engraved hexes), 30 black discs, 30 white discs, 30 red discs and a cotton case for keeping them. The discs are made of 28 mm diameter and 6mm thick laser-cut acrylic. It weights around 2 kilograms. There is room enough in the briefcase for a few more nestorgames.